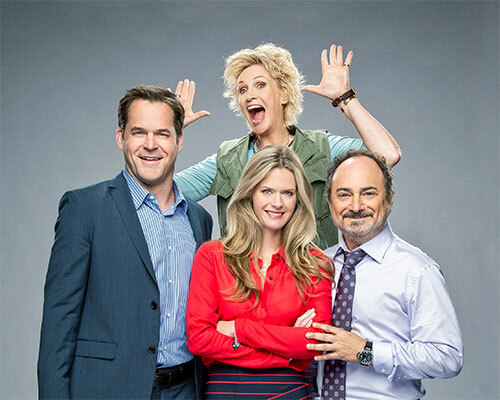 Effective immediately CBS has pulled single-camera comedy Angel from Hell from its Thursday night lineup. A rerun of The Big Bang Theory will air this Thursday (Feb. 11) at 9:30pm. The Jane Lynch/Maggie Lawson comedy has struggled in the ratings. Starting Thursday, Feb. 18, 2 Broke Girls will move back to Thursdays at 9:30pm after its short Wednesday run in between seasons of Survivor. No word yet when fellow Wednesday comedy mate Mike & Molly will return, as only 6 of its 13 episodes were planned to air on Wednesdays. As for Angel from Hell, only 5 episodes of its 13 episode order have aired and no word if CBS will burn them off anywhere at some point (perhaps online at cbs.com or Saturday nights?). Angel from Hell is a single-camera comedy about Amy (Jane Lynch), a colorful, brassy woman who insinuates herself into the life of an organized and seemingly perfect young woman, Allison (Maggie Lawson), claiming to be her "guardian angel." COZI TV said it has expanded its relationship with network spokesperson, Antonio Fargas, naming him the official "voice" of COZI TV. In his new role, Fargas will be the voice of all COZI TV promotional materials, starting with a Valentine's Day weekend Hart to Hart movie marathon set for Saturday, February 13 and Sunday, February 14 at noon. Fargas will make his debut as the voice of COZI TV on Valentine’s Day weekend, with the two-day Hart to Hart marathon that features seven, 90-minute made-for-TV movies that aired in the 1990s, nearly a decade after the popular television series ended. The movies reunited stars Robert Wagner and Stefanie Powers, who played Jonathan and Jennifer Hart, a wealthy couple that led a jet-set lifestyle while working as amateur detectives solving crimes. Hart to Hart airs weekdays at 2 PM and Monday nights at 8 and 9 PM ET on COZI TV. Since the 1960s, Fargas has captured the attention of audiences with his performances on stage, television and film. A versatile actor, he is perhaps most well-known for the iconic role of "Huggy Bear" on the buddy cop series Starsky and Hutch, which airs on COZI TV Sundays at 11 AM and noon. Huggy Bear was a bar owner and streetwise police informant who directed tips to police officers David Starsky and Kenneth "Hutch" Hutchison. Although the role of Huggy Bear was not initially scripted as a regular character, the producers of Starsky and Hutch noticed the chemistry that quickly evolved among Fargas and stars Paul Michael Glaser, who played Starsky, and David Soul, who was Hutch. Fargas ended up remaining with the cast through the entire run of Starsky and Hutch. After Starsky and Hutch ended its run in 1979, Fargas actively continued his stage, film and television career. With notable roles in significant films such as Foxy Brown, Don't be a Menace and Car Wash, as well as guest appearances on series like The Fresh Prince of Bel-Air, Martin, Living Single and The Steve Harvey Show, Fargas has remained a consistent figure in popular culture for newer generations.